Bel Canto is devastating and beautiful. It is exquisitely written, sucking you into the story from the very first page. It is a tale of hopelessness, humanity, empathy, and love. In a desperately poor and brutalized country, where citizens are abducted by the army in broad daylight, people have been driven into the jungle, and armed revolution seems the only alternative to a lifetime of intimidation. Circumstances have turned ordinary men into terrorists and children into killers. For these individuals, the revolution is everything. When a meticulously planned mission to kidnap the president goes terribly wrong, 60 lives take a wildly unexpected turn. Instead of nabbing the president and melting back to the jungle, a small band of terrorists is trapped in a sprawling mansion, with globally powerful chief executives and diplomats as their hostages. We’re told right at the start that the terrorists won’t make it out alive. What we don’t anticipate is how their deaths will break our hearts. The story takes place entirely inside the vice-president’s mansion. Like the terrorists and the hostages, we the readers are locked inside the house, unaware of what’s happening on the other side of the enormous wall, unconnected to the diplomatic wrangling and military planning that must be taking place. As the days and weeks of the siege roll on, we come to know the individuals inside, terrorists and hostages alike. We are privy to their thoughts, hopes and fears. Executives and vice presidents are simply men, with infinite quantities of free time on their hands. We witness their confusion as their former lives fade into insignificance, and life becomes nothing but the here and now. The only woman among the hostages is an internationally renowned opera singer. She makes captivity bearable, even appealing, with her sensational voice. Music becomes a shared language, easing the tedium of captivity, calming frayed nerves, and binding together a disparate group of multiple nationalities and languages into a strangely cohesive and functional unit. The terrorists reveal themselves as complex, sympathetic individuals, for the most part young teenagers. We realize the exceptional people they may have become, if only circumstances had been different. Cesar, an acne-scarred child-soldier, is an outrageously talented opera singer. Carmen is a beautiful young girl with a knack for languages. Ishmael is a gangly 14 year old desperately in need of a dad. But hopes and dreams will come to nothing for this small group of revolutionaries, and for a whole country of desperately poor, powerless people. The terrorists’ deaths come suddenly, violently, without warning. It’s all over in an instant, leaving shock and despair. With one tragic exception, the hostages walk free. We barely have time to absorb the terrible climax of the siege before we’re pulled away, back to the real world, just as the hostages are. But it’s too soon. Fifteen people, some of whom we care about a great deal, are dead, and human relationships that evolved in captivity are scattered and gone. The siege is over, but the terror persists. The book’s last two pages, in a sundrenched street in a pretty Italian town, evoke the choking fear and panic and that will always haunt those who survived the ordeal. The story is desperately sad, not least because of the inevitability of its tragic ending. Governments will crush peasant revolutionaries, poor orphans from the jungle won’t become world famous opera singers, and ‘real life’ with all its pressures and compromises will prevail. But it’s also about compassion, and our ability to understand and care about each other across seemingly insurmountable boundaries. 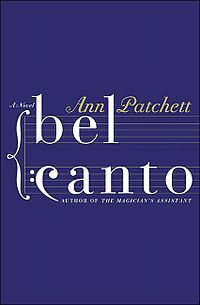 That, together with the beauty of Ann Patchett’s writing, makes it a must-read. This entry was posted in Book Reviews and tagged Ann Patchett, books, literature, opera, Peru, revolution, terrorism, www.bookdrum.com. Bookmark the permalink.